This cake is fantastic. It's a cake that's sturdy enough to soak up the three milks it's glazed in. Topped with fresh whipped cream and garnished with macerated strawberries, it's completely heaven. The original called for preparing it in a 9x13 baking pan but I chose to do it in a springform pan instead. Regardless of which pan you make it in, make sure that it will be big enough to bake the cake in and hold the milky glaze. At first you may question how the cake will even absorb all the milk. But don't worry... chill the cake overnight with the glaze and by morning, the cake will have absorbed every drop. Once you cut into it, you'll notice how perfectly the cake captured the glaze and with the whipped cream and strawberries, it's a dessert you'll have a hard time resisting! Preheat the oven to 350 degrees F. Lightly oil and flour a 10-inch metal springform pan and set aside. Do not remove the cake pan to a cooling rack and allow to cool for 30 minutes. Poke the top of the cake all over with a skewer or fork. Allow the cake to cool completely and then prepare the glaze. Meanwhile, chop up the strawberries and place in a bowl with 2 tablespoons of sugar. Toss to combine and set aside until ready to serve. Place the cake on a serving platter. Carefully remove the ring from the springform pan. 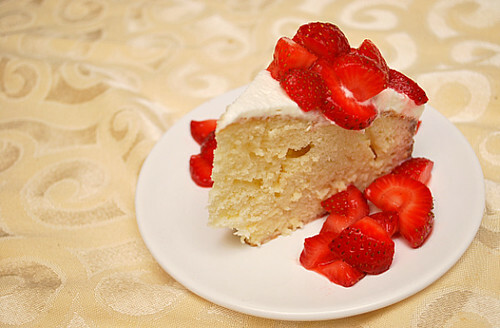 Slice the cake to serve and garnish with a spoonful of strawberries. This is such a gorgeous Tres Leches cake! And after a meal with those fried plantains -- ohhhh heaven! I have always loved tres leche. Yours look devine. This sounds alot like a recipe I use. I have added Kahlua to the glaze mixture - it's amazing that way! Nom nom nom! Ever since I took my first bite when I lived in LA, this has been one of my favorite desserts. Will definitely give your recipe a try since I can't find a good one here in Chicago! I made Alton Brown's tres leches cake, too for my birthday ylast January and it was AMAZING!!! Love the strawberries!! Mmmmm i tried Tres Leches for the first time a few months ago and have been dreaming about it ever since! yours looks soooo good! My GOD does that look amazing. Thanks for sharing this awesome recipe, Joelen. My husband and coworkers devoured it!